How to Make a Phonograph. By Shelford Bidwell, M.A., LL.B. same pitch as the screw upon the spindle — i.e., eight threads to the inch. Tbe depth of the spiral groove thus formed is 1-16 inch, and its breadth is 1-16 inch. It is better to cut it square, and not V -shaped. Two brass bearings for the spindle are made of the following dimensions— length, 2 1/2 inches ; thickness, 1 1/2 inch ; height, 1 1/2 inch. One of these has an inside screw corresponding to the screw upon the spindle. Each bearing has two holes for screwing it to the support, as may be seen in Fig 1. which is engraved from a photograph of the instrument. The cylinder, spindle, and bearings being completed, ten pieces of wood must be prepared as follows : — A is 12 inches x 9 1/2 inches x 1 1/2 inch.B is 3 inches x 3 inches x 1 1/2 inch. C is similar to B. D is 5 1/2 inches x 5 1/2 inches x 1/2 inch, and has a circular hole, 2 1/2 inches in diameter, cut in its centre. E is similar to D. F is 5 1/2 inches x 5 1/2 inches x 1/2 inch, and has a hole, 1 inch in diameter, in its centre. G is 5 1/2 inches x 2 1/2 inches x 1/2 inch.H is similar to G. I is 8 inches x 2 1/2 inches x 1/2 inch. K is similar to I. B and C are the upright supports for the bearings, one of them being shown in Fig. 1. The position of the others is indicated by the letters corresponding to them in Figs. 2and 3. The uprights B and C are fixed near to the ends of the baseboard, A, by means of 2 1/2 inch screws. D and F are screwed together (see Fig. 1. ), and the two are then fixed perpendicularly upon G. G is joined to I by a pair of hinges. The two ends of I are screwed to the baseboard, but the holes in I are 1/2in. larger in diameter than the screws which pass throuh them. The heads of the screws are effectively enlarged by iron washers 3/4 in. in outside diameter. The object in this arrangement is to allow a certain amount of play in the board, I, for purposes of adjustment. When properly adjusted the screws may be tightened, and the board firmly fixed in position. E is attached perpendicularly to H, and made right with two small triangular pieces, which are not shown in any figure. H is hinged to K, and K is fixed to the base in exactly the same manner as I.
those who wish to make a phonograph, that the performance of the instrument here described is at least equal to that of any which has hitherto been exhibited in London.— Mechanic. Shelford Bidwell, inventor, late 19th century. I hope that you have enjoyed this very detailed scientific article written by my distant cousin Shelford Bidwell. Bidwell anticipated what would later become television. Inspired by experiments with the photophone, Bidwell went on to attempt the 'telegraphic transmision of pictures of natural objects'. The photophone, invented by Alexander Graham Bell (1847-1922) in 1880, worked by transmitting sound on a beam of light. 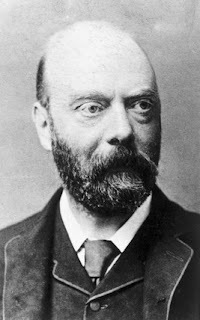 Bidwell used the principle of the Bakewell or D'Arlincourt copying telegraph, 'in which the variations of the current necesary to produce the design are effected by the action of light on a selenium cell'. Bidwell was President of the Physical Society from 1897 to 1899. Images and text owned by other copyright holders are used here under the guidelines of the Fair Use provisions of United States Copyright Law. These images and text are used here only for the education of genealogy and are not intended to generate income.